As I already told at some point, armies will play a great role in my current game, especially since it could get a bit hard trying to take over the world without any armies. So I decided this part to be the first one that I’ll try to get playable before getting to the other parts. 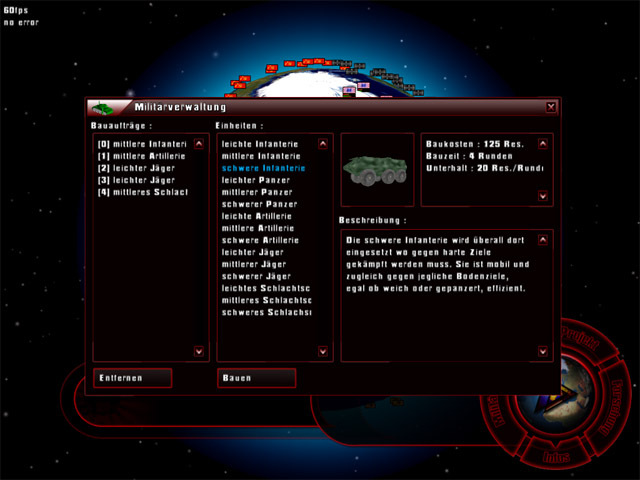 After having my WeltEdit so far finished that I was able to create the units that’ll be in the final game, I finished the army building window in the game (see the screenshot) and the player is now able to qeue units which will then be build and transfered into a global unit pool (contrary to my first design draft, units will be managed global, not regional anymore), from which the player can assign them to an army later on. And as you can also see, the window also has a nice preview of the selected unit in 3D which is currently realized via an offscreen pixelbuffer. Though I’d like to use FBOs instead of PBOs, FBOs are still to new and I also want the game to run on older hardware. 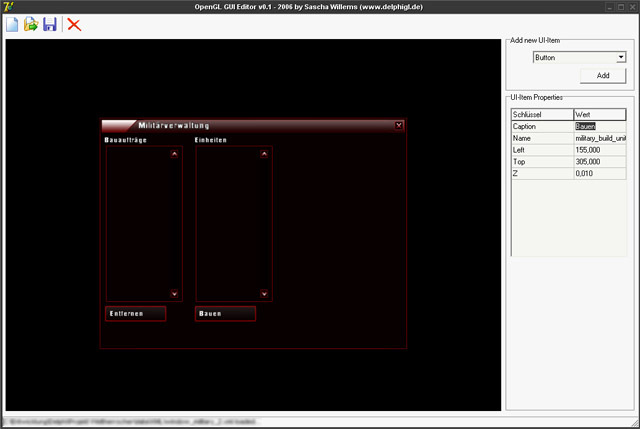 In addition to coding on the game itself I finally decided to create a small GUI-editor. Up until now I changed the XML files that described the GUI (and windows) in notepad, but some windows (like the above) are rather complex, so changing them by hand was no solution. The editor itself is very simple, you have an OpenGL-preview for the GUI and you can place new elements on it and change their properties, much like what you do with Delphi when creating Win32-UIs. Nothing special and certainly nothing that thousands of other coders don’t have, but somehow I felt the need to mention it here. And so the game slowly starts to come together and I must also admit that coding games really makes fun again after my longer break. Stay tuned for the next update!